Final Dawn was formed in the summer of 2000 by guitarist/vocalist Vesa Mattila, drummer Mikko Törmänen and bassist Hessu Meriläinen. It took a while to find another guitarist to complete the band, but finally in the spring of 2001 guitarist Marko Leiviskä joined the band. Final Dawn recorded the “Suicide of Your World”-demo in April 2001 in their rehearsal­place. Although the demo suffered poor quality it got some positive feedback from different record labels. However, the band remained unsigned. In August 2001 bassist Meriläinen was replaced by Toni Laine and since then the line-up has been the same. In September 2001 Final Dawn recorded a 2-song-promo, “Aggression Overdrive”, at the Tico Tico studios. In the end of 2001 V-P Haastola directed the “Aggression Overdrive”-video, which is a great proof of band’s ultimate aggression on stage. The video has been featured in the MoonTV’s 667 and Top6 and it was also the video of the week in SFPerkele netmagazine in February 2002. The song “Aggression Overdrive” has also been broadcasted in Radiomafia’s Metalliliitto. Final Dawn has made few gigs during the autumn 2001 and the spring 2002. Perhaps the best gig so far has been the Band contest in Woodoo, Oulu where Final Dawn was placed on the second position. After hard promoting of “Aggression Overdrive”, several labels showed their interest again. 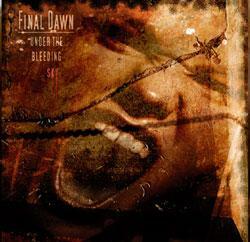 In the beginning of the summer 2002 Final Dawn was signed to a small english label. A 5-song MCD was recorded in January 2003 at the Sonic Pump studios, Helsinki. But things didn’t went well with the label and the deal was terminated at spring 2003. After negotiating with few labels Final Dawn signed a deal with New Aeon Media, which is a sublabel of Karma­geddon Media (ex-Hammerheart Records) in November 2003. The band went back to the Sonic Pump Studios to record three new tracks to complete the “Under The Bleeding Sky”-album. Killer debut album (8 songs, 40 minutes) release date is set to March 22nd 2004.